We’re already through the first month of the NFL season and I’m still not really sure what to expect from the Eagles week to week. It’s been an up and down season thus far and the Eagles have finished the first month at 2-2. Not quite what we expected from the reigning Super Bowl Champs, but it could be worse. In week one, the Eagles squeaked out a victory against the Falcons that seemed eerily similar to their Divisional Playoff win last January. They lost the following week down in Tampa to a Bucs team that was in the midst of an extended Fitzmagic Miracle. Then Wentz came back and looked great, albeit a bit rusty, and won a game at home against Indy that shouldn’t have been as close as it was. Then there was last week, when the secondary completely crumbled against a receiving core that no one outside of Tennessee (and now Philly) could name. The secondary looked lost without Rodney McLeod against the Titans offense. The Eagles will continue to get better. Carson Wentz has only played two games this season, so he’ll continue to shake off what little rust he’s had. The receiving core was decimated and it’s a damn good thing they have so many competent running backs because it’s been a carousel of injuries in the first quarter of the season. The Eagles have gone 2-2 against their first four opponents, who have combined for a record of 7-9. The next 12 games are going to get tougher, as the rest of their season opponents have combined for a record of 24-20-1. The Eagles defense has a Rodney McLeod sized-hole in the secondary, but their ability to stop the run has been immaculate. The Eagles “bend, but don’t break” D is also 4th in Opponent Red Zone Scoring. They’ve been holding opponents in the red zone, but they can’t stop the deep ball right now. The defensive scheme will have to change to accommodate the current secondary’s strengths. We’re seeing corners left on an island getting burned in man coverage with little to no help over the top. The Eagles are touting a -3 turnover differential this year, which is not on par with last’s year +11 differential. While they’re 8th in the league in points given up, they’re 23rd in points scored. This can largely be attributed to injuries and a lack of consistency in lineups. Two different QBs and injuries at the RB and WR position have made it hard to maintain any momentum. Despite all of this, there’s no need to panic in Philadelphia. 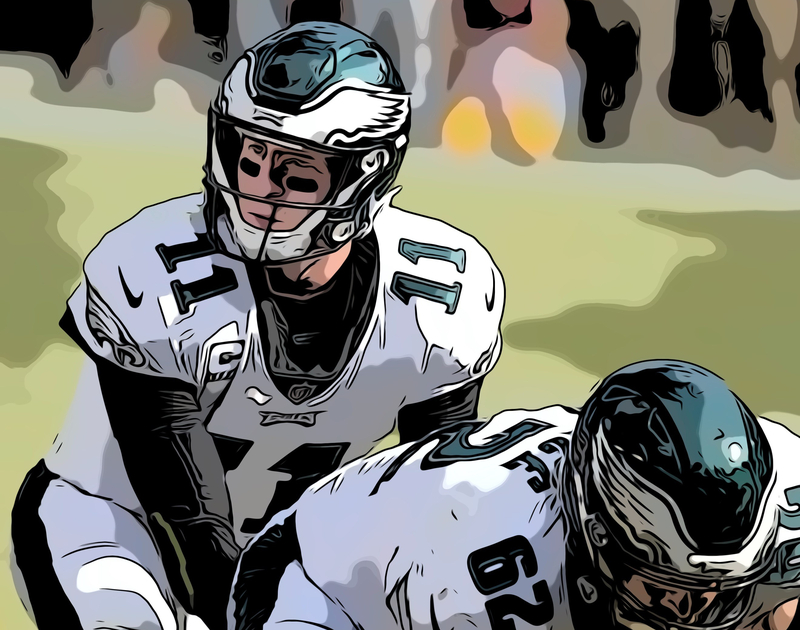 Wentz will continue to get better. The return of Alshon Jeffery (8 catches, 105 yards, and 1 TD) has given Wentz his deep ball target back. There’s no reason to think that this Eagles team won’t make another deep playoff run. This team will hit it’s stride in time to be at the top of the NFC come December and into January.